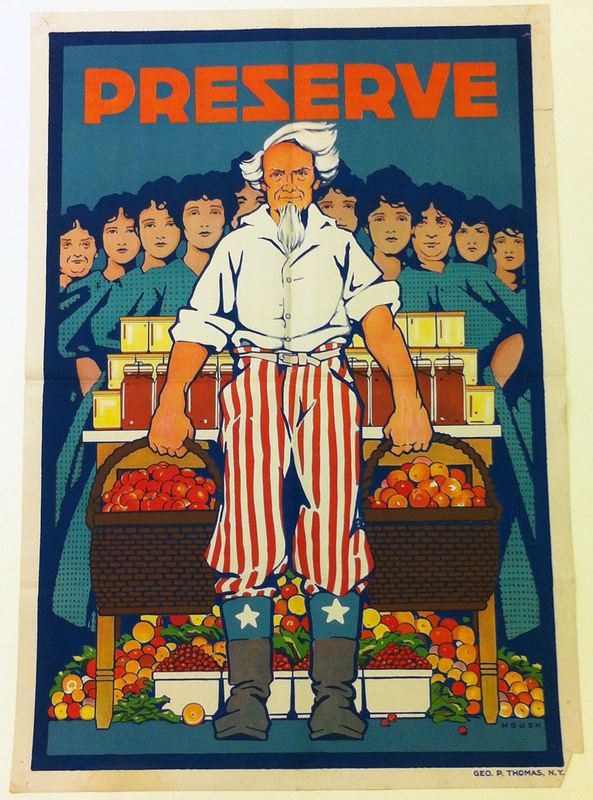 In March 2012 eight wooden crates of WWI posters and ephemera were transferred from the Mead Art Museum to the Archives & Special Collections. These WWI materials all came from John P. Cushing, Amherst Class of 1882, and a complete guide to the collection is now available. John Pearsons Cushing was born in Lansingburgh, New York on September 5, 1861. He attended high school in Lynn, MA after which he studied for two years at Boston University. He transferred to Amherst College in 1880 and finished his B.A. with the class of 1882. He went on to receive his M.A. from Amherst in 1885. During the time he spent working on his masters degree he also taught at Holyoke High School. He acted as Vice-Principal of Holyoke High from 1889-1892. From 1892-1894 Cushing attended the University of Leipzig. His dissertation, ‘The Development of the Commercial Policies of the United States’ was published in 1894. Cushing received his doctorate in philosophy from the University of Leipzig that same year. 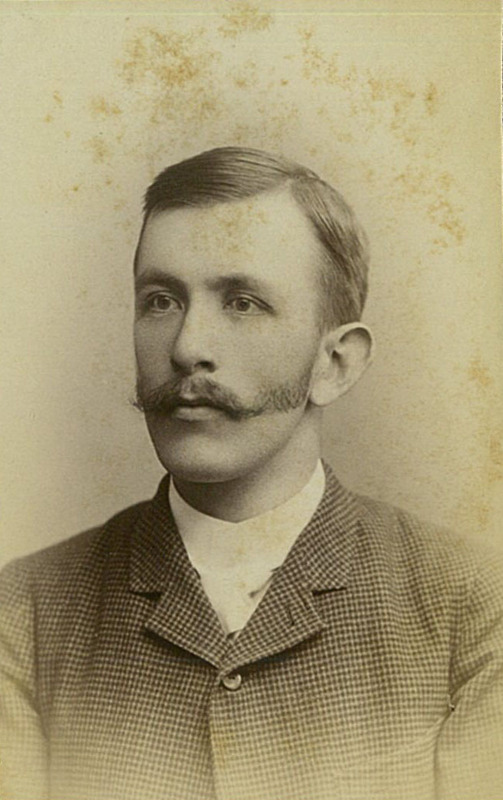 Upon his return to the United States, Cushing became a professor at Knox College in Galesburg, IL from 1894-1900. He returned to New England in 1900 to begin serving as headmaster of Hillhouse High School in New Haven, CT. 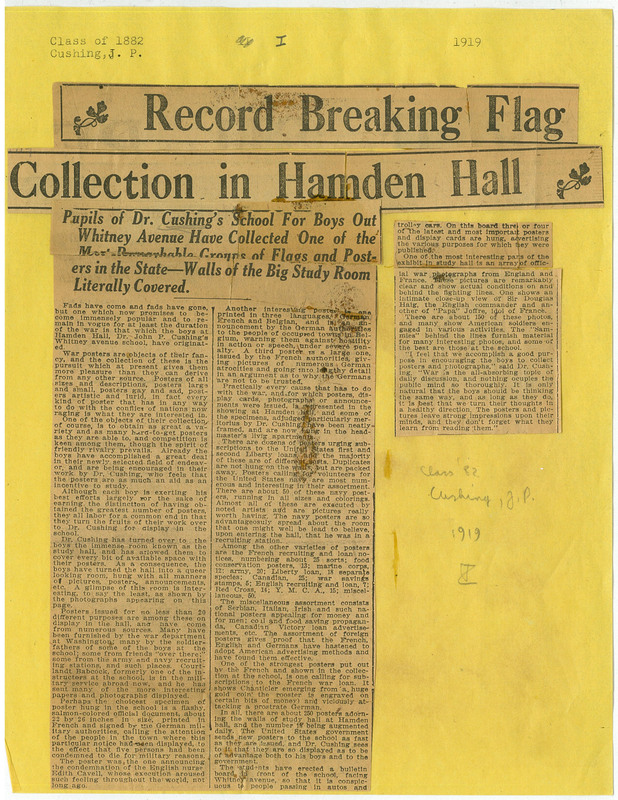 In 1911 Cushing left Hillhouse in order to begin his own country day school for boys. Hamden Hall opened in Whitneyville (what is now Hamden) CT in 1912 where Cushing acted as headmaster until his retirement in 1927. During the outbreak of the first World War, governments across the globe realized that they needed an effective way of communicating their needs to the general populace. 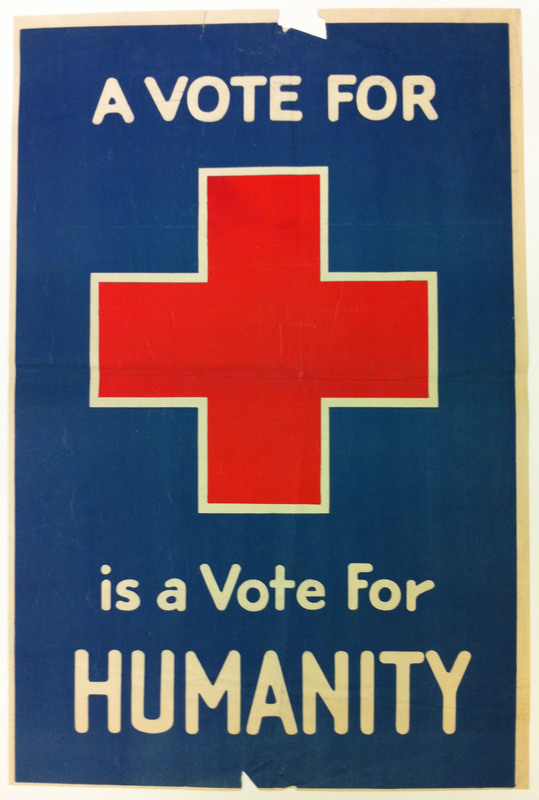 Through the production of propaganda posters, they could reach a wide audience and create a unified cause for citizens to get behind. 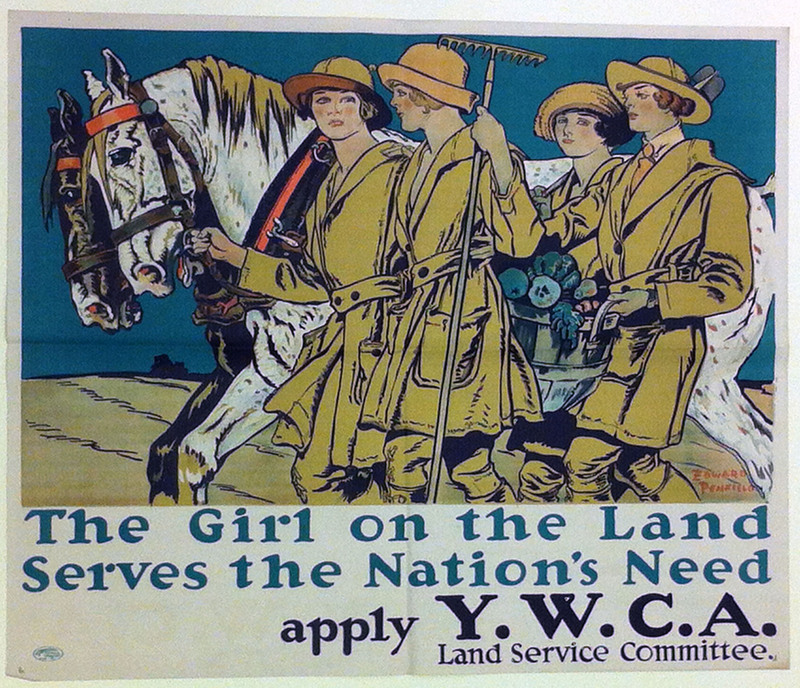 Citizens contributed to the war effort by enlisting, constructing military supplies, conserving food, and buying war bonds. 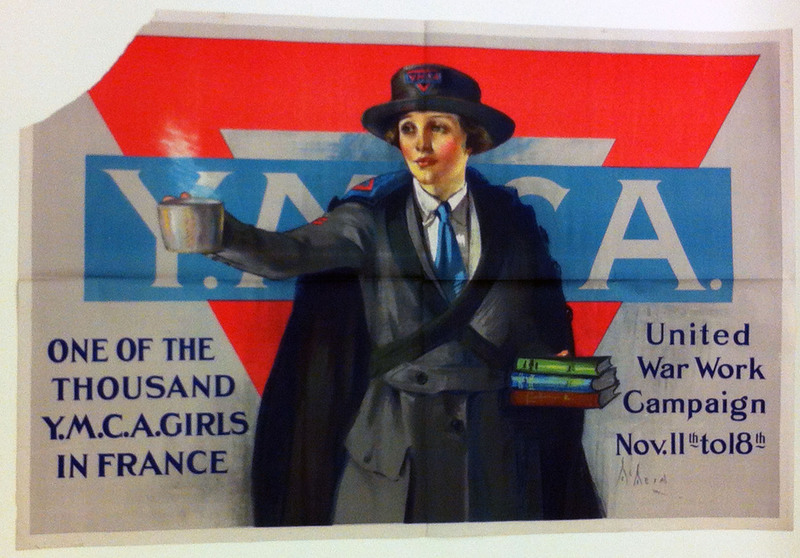 Artists contributed by donating their work to various government agencies for the propaganda posters. These colorful works of art appealing to patriotism and nationalism grabbed the attention of the viewer and communicated a message powerfully and succinctly. The visual appeal of the posters was made possible by the printing process known as choromolithography. In this process, a flat piece of limestone is used. The positive part of the image is applied with an oil-based ink. The rest of the stone is washed with a water-based solution. The oil repels water so that when the paper is applied, only the oil sticks and the rest of the sheet is kept clean by the water. This process can be done multiple times with different colors in order to achieve a poster print with as many colors as the artist desires. The most difficult part of this process is keeping the same alignment during multiple prints on the same poster. 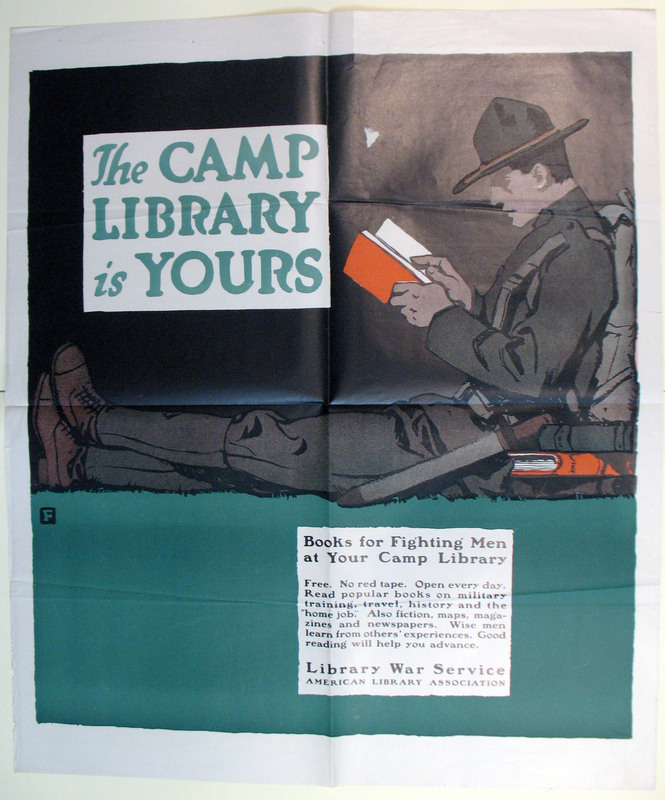 This collection contains more than 700 World War I posters, ephemera, and propaganda collected by John P. Cushing (AC 1882). The collection includes work from the United States, France, Germany, Italy, Great Britain, Canada and Spain. The finding aid for this collection includes item level detail about each poster. Many of the posters in this collection have been photographed and the images are available on the Archives’ Flickr page. To view items from this collection in the Archives, please contact the department in advance to request access at archives@amherst.edu. From now until the end of May, visitors to the Morgan Library & Musuem in New York City will be able to stand in one room and see Emily Dickinson manuscripts and other pieces drawn from seven different collections. The exhibition is the culmination of a two-year collaboration between the Amherst College Archives & Special Collections and the curators of the Morgan Library. I want to use this blog post to thank several of the people who made this happen, starting with my collaborator on the Morgan side, Carolyn Vega, Assistant Curator of Literary and Historical Manuscripts. I often say that I got to do the fun parts of the exhibition while Carolyn took charge of less-fun things, like arranging loans from several different repositories. That very work is what makes this exhibition so special — many of the items brought together have never been exhibited together before, and will likely not come together again for quite a while. Chief among these items is the famous portrait of the Dickinson children, which has not left the Houghton Library at Harvard University since they acquired it in the 1940s. Here is the portrait as it is now displayed in the gallery at the Morgan, against a backdrop of the reconstruction of the wallpaper from Dickinson’s bedroom. That wallpaper was only discovered as part of the reconstruction of Dickinson’s bedroom undertaken by the Emily Dickinson Museum in 2013. We are all very grateful to Houghton Library for lending this work, and to Jane Wald and the crew of the Emily Dickinson Museum for their support of this exhibition. While this daguerreotype remains the private property of an anonymous collector, “Sam Carlo” was kind enough to place it on deposit at Amherst College and to allow us to include it in this exhibition. For the first time ever, visitors can see the portrait of Dickinson as a child (Houghton Library), the silhouette cut when she was 14, the lock of her hair, the authentic 1846 daguerreotype, and compare all of those likenesses to this recently discovered image. Other lenders to the show are: the Emily Dickinson Museum, Mount Holyoke College, New York Public Library, and Boston Public Library. The Morgan’s own holdings of Dickinson manuscripts round out the total of seven institutions who contributed to making this show a success. Many thanks to all of them. Another massive thank you goes out to Mark Edington, Director of the Amherst College Press, who valiantly managed the production of the exhibition catalogue: The Networked Recluse: The Connected World of Emily Dickinson. As with all of the products of the Amherst College Press, anyone with an internet connection can download the complete work as a PDF file. Copies of the printed book are currently available through the Morgan Library gift shop. Many thanks to Mark and to our contributors: Marta Werner, Susan Howe, and Richard Wilbur. Last, and definitely not least, I must thank the staff of the Amherst College Archives & Special Collections for their knowledge and support and patience. We have a lot to be proud of, and none of it could have happened without them.